Kirk Trigsted revolutionized the way this course is taught when he created College Algebra, a completely clickable eText that was written from the ground up within MyMathLab®. Recognizing that today’s students start with the homework instead of reading the text, Trigsted created an online learning environment that is a seamless mix of exposition, videos, interactive animations, tutorials, and assessment. This approach leverages the power of MyMathLab and leads students to interact with course materials in a way that is proving to be more effective. With this new edition, Trigsted continues to innovate with a revised design with improved navigation and usability, expanded videos, and increased animation coverage. As with the prior edition, all multimedia elements, exercises, feedback, and content are written by the author himself, so that the students have a consistent voice throughout the eText. Kirk Trigsted teaches mathematics at the University of Idaho and has been Director of the Polya Mathematics Center since its inception in 2001. 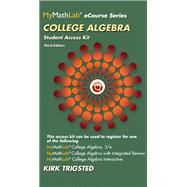 Kirk has taught with MyMathLab for many years, and has contributed to the videos for several Pearson books. Kirk is also actively involved with the National Center for Academic Transformation (NCAT).